Adding a useful informatin to your video files – such as title, authors, the date of production, and some description – can be quite helpful to both yourself and your customers. This additional data – or meta data – can be used by media players to organize your many video files. Unfortunately, while adding such meta data to audio files is straightforward, adding useful meta data to video files is … a nightmare. But don’t despair, as we’ve compiled some useful information for you! Kdenlive allows you to specify the meta information that should be added to a rendered file. Just go to Project > Project Settings, then select the second tab named Metadata. author – doesn’t work for .mp4 containers, but for .mov containers; you may use artist instead with .mp4 containers. year – please note that this element does not work for video rendered into MP4 containers (such as .mov and .mp4). See below for more details. Use a date element instead. Oh, this year element is actually quite pesky: you can delete it, but it will automatically reappear. So simply ignore it … as ffmpeg does too. But there are more elements that you actually may use with your MP4 containers. Unfortunately, there are competing sets of meta data when working with MP4 containers. The older, standard MP4 set is rather limited in what additional meta data can be used. Then, there is Apple iTunes, and that brings in a lot of meta data, and even changes the allowed set from time to time. We will come back to this difference in a second. Unfortunately, information about what meta data can be used in which situation is rather scarce, sometimes outdated, and sometimes plainly wrong. Of course, this may also apply to this Toolbox article, but I’ve taken much effort to cross-check things in real life. As Kdenlive uses ffmpeg for encoding, one would think that there’s plenty of information – unfortunately, it’s not, and the scarce information is sometimes plainly wrong. At some point, I’ve resorted to reading the source code in order to find out which so-called MP4 atoms actually are supported and through which element names (the magic happens inside mov_write_ilst_tag() in moveenc.c). Luckily, you don’t need to dive into the source anymore. Finally, please note that other container formats, such as Matroska (.mkv) or *cough* Audio Video Interleave (.avi), support yet other sets of meta data elements. So, variance galore! But now for the real meat: here come the available meta data elements that ffmpeg supports. Please note that you must use the ffmpeg meta data keys from the second column in the table below as the metadata keys in Kdenlive’s Project Metadata dialog! Ffmpeg supports different meta data elements, based on the type of container. And this container type normally gets derived from the container filename suffix (ending): in particular, .mp4 and .mov. There is no way to add cover art or DVD art to MP4 containers through ffmpeg, and in consequence, in Kdenlive. Instead, you need to resort to other video container tagging tools, such as AtomicParsley. The following references give some more background information on ffmpeg and meta data in .mov/.mp4 containers. First, and foremost, the ffmpeg source code for reference, and moveenc.c in particular. mov_write_ilst_tag() is responsible to write the iTunes-compatible tags for .mp4 containers. mov_write_udta_tag() write the MPEG-standard tags instead, when using a .mov container. How To: Create/Write ID3 tags using ffmpeg by Jon Hall. This article finally got me on the right track. However, beware of a few incorrect ffmpeg keys in Jon’s table (such as the TIT3 key, which I think isn’t correct); these may be due to later changes in ffmpeg (or whatever). In the end, since some of Jon’s keys didn’t work, I went for the ffmpeg source code which is the authorative source, of course. Nevertheless, I’m very thankful to Jon and he is some of the rare really good sources with good insight into the topic. Most other source just tell you how to press some buttons on some application, but don’t give you any clue as to what is actually going on behind the scenes. How To: Dump and Load metadata with ffmpeg by Jon Hall. Sheds more light on how to work with meta data when it comes to ffmpeg. FFmpeg Metadata article from the MultimediaWiki. 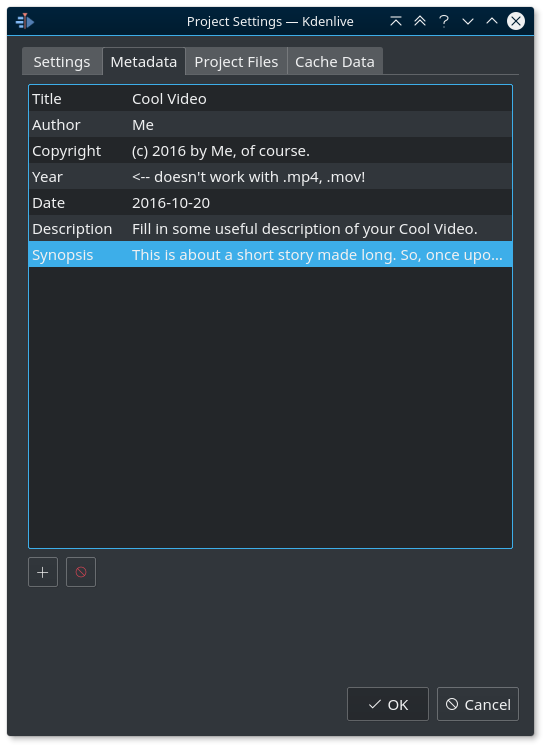 Is it possible to add some custom atom in the header of a video file? I need to add the term “loop” in the header of MP4 files before the “moov” atom. Note: Just opening the video file using any text editor shows the file header and atoms. the atom “loop” to any MP4 files? “loop” atom in the header. Kdenlive leverages ffmpeg for encoding, so if ffmpeg doesn’t support certain atoms, there’s no way for Kdenlive to get it into the rendered output file. I checked the most recent moveenc.c from ffmpeg’s source code repo and it doesn’t include support for the LOOP atom. Only after ffmpegs adds support for the LOOP atom with a corresponding metadata key(!!) you can start using it in Kdenlive without the need for any Kdenlive updates, as you could then simply set the key through the project meta data dialog. But you need ffmpeg supporting this.